WHOA met with Mr. Lucero the Sunday before the June 5th meeting, with a number of Placitans at the Merc at my request. I have neither been given nor been directed to an application, and I have never refused to fill out an application regarding these matters. 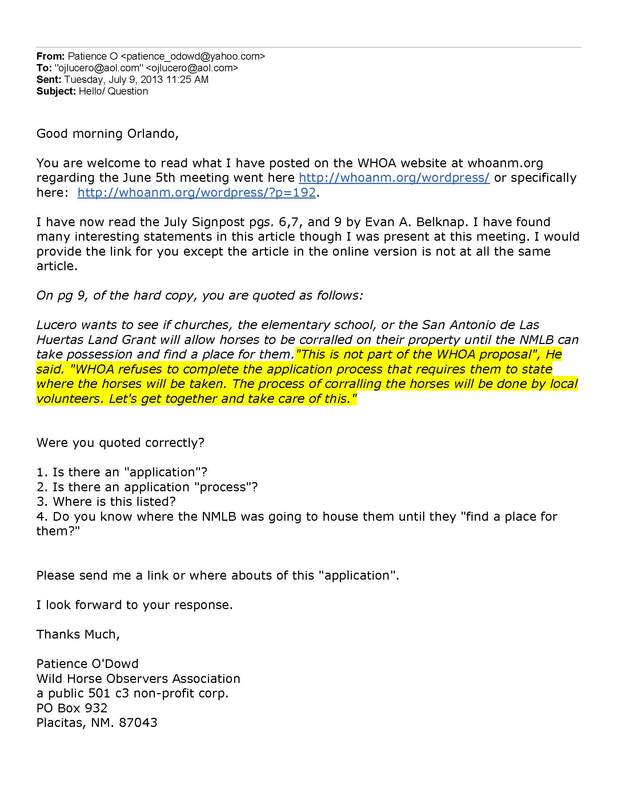 I requested an immediate answer to the following email correspondence, which has gone unanswered for 5 days to date (7/14/13). This entry was posted in Placitas Wild Horses and tagged BLM, New Mexico, Orlando Lucero, Placitas, Placitas Wild Horses, Sandoval County, Signpost, Wild Horses. Bookmark the permalink.